My home for 20 years. I haven't been to my hometown of Price, Utah for almost a year. 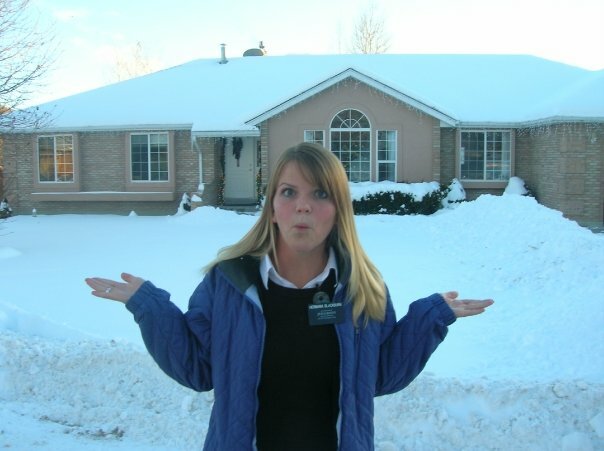 My mom sold our house in Price and moved up to Provo less than a year after my dad's death. When I visited home in the year after he died, it took me the entire 90 minute drive from Provo to Price to prepare myself mentally to be in my house, to be there without dad, to be "home" but not feel like it was still "home". After my mom moved, it wasn't something I had to deal with anymore, and in a way I have mentally blocked out Price. It's been two and a half years since my dad passed away, and while I don't totally understand the grieving process, I do understand that I am in some ways still going through it. This was evidenced this weekend when Hubs and I decided to take a camping trip down to Moab. Going to Moab requires going through Price. It wasn't until we were on the road that I started getting scared. I realized I would have to go through Price, and that it could be difficult. Every street, every store, every landmark reminded me of my dad, of my family before he died, of my childhood, of what once was. Passing through Price I described to Hubs, "that's the car wash where I hosed down my friends on the last day of school", "that's my elementary school", "that's my dad's old office building." We even stopped at KFC for lunch and I remembered my 17th birthday, eating there with my parents and my little sister and how now it's just a joint that we stop at on our way home from camping. Isn't it weird to revisit a place that held so much significance in your life? To return to a place that was your home but that isn't any longer? I felt the same way when I went back to visit Argentina two years after my mission. To be on the same dirt roads, to go to the same little shops, to return to an earlier stage of life. It makes me think of the place I am in now, and wonder if one day it will be weird for me to return, maybe with my kids in tow, to this apartment complex or to Copper Hills High and say "That's where your dad and I lived when we were first married" or "that's where I had my first real job." It is crazy for me to think not only of the significance that people have in my life, but of places too. On our way home from our camping extravaganza, I wanted to drive past my old house. But I just couldn't bring myself to. So we drove on through, on toward Provo, and I promised myself that next time I'll stop by the house. I guess that I gain strength and work through my grief one step at a time. And the next step? Getting my damn feet taken care of. These burning toes have got to go! That's the first verse anyway. The last time I went back to 620 N. after Mom sold the house was tough too. It'll never be the same! This speaks to my heart. When my dad passed away, my mom told us that there was no way she would be able to afford our house without him. Me and my fiance are still living in the house with her now and she is getting by, but she knows that she will have to downsize someday and if my sister or I can't afford to buy the house from her, it means that there will be strangers. IN MY HOUSE. I can't handle that. It's OUR house. OUR memories. Not for someone else to come in and try to turn into their own. That is my biggest nightmare. To drive past this house that my family built and know that there are people inside it that could never possible understand the importance of it. You have no idea how happy I was to read this,knowing I'm not alone. Just 2 days ago I visited the town I grew up in (my parents live in another town now). I was so excited to show my boyfriend all the landmarks and explain the memories. I was overwhelmed with sadness. He couldn't see what I saw. I was so emotional about it that last night I wrote down my feelings and how nobody could see what I see when I go back 'home'. I thought I was nuts for being like this,figured I was the only one. You can imagine how surprised today to read this blog entry. Thanks for writing this. Great post, Bonnie :) Glad you were able to show Greg some of the special places in your childhood. I remember it seeming strange when I took Geoff to Price for the first time too. It's definitely a reminder to be happy with where you are in life right now. Growing up my favorite grandparents lived right next door to us in the country. They both passed when I was in high school. I stayed with my parents for a few months while my hubby was at boot camp. I would walk through the empty house remembering all the Thanksgiving & Christmas parties there. How my grandma made us reenact Christ's birth & how all of us grand kids hated it ha ha. What I wouldn't give to have it all again. To have her at my wedding. To have them meet my future babies. But we have eternal life. We will see our loved ones again. a trip down memory lane... love it!! there really is no place like home (as cliche as that sounds), BUT every time you see your old house, street, hood.. just brings back some fuzziness that your new home can't bring! I'm hosting my 1st giveaway today to say THANK YOU! lalalovelearnandlaugh.blogspot.com! I read this post a few days ago, and I can't stop thinking about it. It doesn't seem like you are feeling bad about not going to the house, but I want to encourage you not to feel tempted to feel bad. This doesn't make sense...um. What I am trying to say is that you are doing exactly what you should be doing. Paying attention to you and your process. There is no blueprint for grief or how we are *supposed* to deal with things that might come up--like a road trip to Moab. Girl, this post had me in tears! I completely can see where you are coming from. It would be so hard to see everything that reminds you of someone that you loved so much but isn't here anymore. I'm dreading those days. You are a strong lady for posting your honest and real feelings about it. Thanks for being so transparent! I totally remember hosing eachother down in that carwash! Wasn't it after a crazy shaving cream fight in the park? Who volunteers to follow me around with a camera? What does your body do for you? Stolen cookie dough and a cute girl from L.A. When Sizzler rejects you. Twice. It's a messed up world we live in. Give oh give, Give oh give!